Unfortunately it has been a long time since i've posted on Age of Warhammer, something I am intending to change! I think because of the tournament myself and Kaelo attended, I rushed the painting of my Ironjawz. 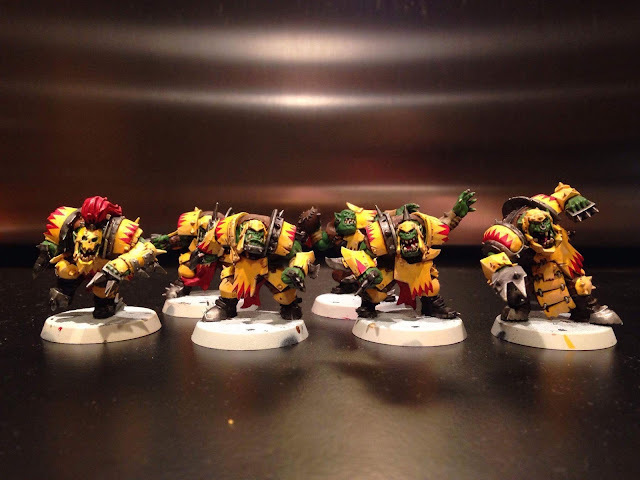 This means I never did actually complete a unit fully and was then unhappy with some of the paint work I did, so I am hoping to return to my Ironjawz soon to tackle some of those mistakes and show you some completed units! Since the tournament though I have been focused on my Eldar for the Battle Bunnies and mainly my Ork Blood Bowl team for an upcoming tournament we are organising between the bunnies in april. So below is a quick look at where I am up to with them. So what my post is actually about the Dwarf Warden King I have been working on for a Silver Tower/Warhammer Quest character! I have always been an avid fan of GW's Dwarves ever since I started in the hobby and they were also my army in Warhammer Fantasy before the world was... erased. So naturally I was frustrated and angry by this at first but then I have grown to really love what GW is doing for Age of Sigmar at the moment and I was soon a full convert, when the three ways to play and most importantly for me the points were introduced. There is still a lot of work to do on the model above and I have had to take a photo without the usual lighting as I am trying to give him the gleaming armour that any heroic dwarf lord would have! I also need to add blue to the inside of the dwarfs gauntlets and finish the cape as it only currently has a light coat of blue just to give me an idea of what the cloak will look like compared to the armour. There is also the green gems on the armour to start and the other obvious bits. I have also tried to test myself by going for zenithal highlights on the silver and gold parts of the armour and building up from the base colours to the gleaming metallics I like on the dwarves. I think this has to be 100% a Dwarf sigil in the corner of this rumour engine picture, meaning they must surely be getting a release at some point in the future! It seems to me this that could be some sort of hull for a dwarf blimp? or maybe a dwarf construct like the ancient dwarf guardian sentinel thingeys in Skyrim? This is purely speculation of course but it would make an interesting and an imposing model on the table top. 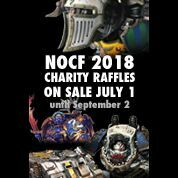 A big impressive model would fit with GW's previous releases like the Mawcrusha or the Lord of Change and maybe a few other kits just like the Ironjaw release! Whatever this is, I am very excited for its release. That is one handsome Dorf!! He looks brilliant mate. I need to start posting more on here too. Will definitely start charting my Kairic Acolyte army when I start in April and will show some of my WIP Silver Tower adversaries! Yes indeed, I couldn't agree more, I truly think this will be a Dwarf release! Especially.... and I'm hoping...... from this weeks rumour engine!